Dana Dolly Hi Hat Universal Kit. 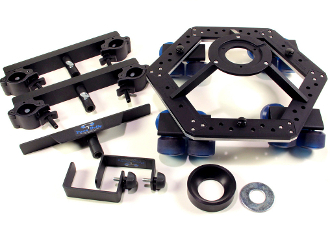 Includes: Dana Dolly Hi Hat, Slider adapter Plate with wheels, 2-Universal Track Ends, Center Support, Anti-Tip Kit, 100mm adapter, washer Made in USA. Mil-spec Black Type 3 anodized.